This issue is the second installment of The Scourging of Shu-Torun, the final arc of Kieron Gillen's run on the series. It's shaping up to be a bit more eventful than the previous arc, The Escape, which was a breather for the series after the big event of Hope Dies. I thought the arc got off to a decent start but the first issue was a lot of setup and I wasn't particularly attached to some of the characters that were brought back from previous arcs. 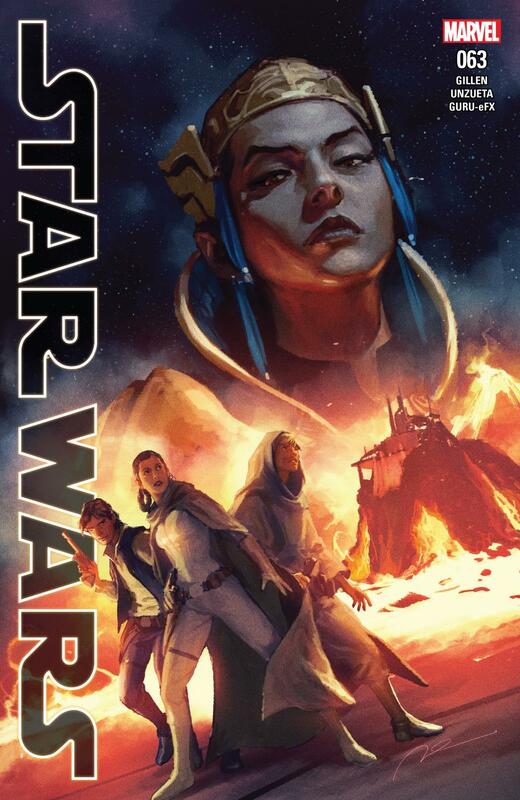 The plot continues from the previous issue: Leia has put together a team composed of characters from earlier arcs to help her take down the Imperial production world of Shu-Torun and take revenge on Queen Trios, who betrayed the Rebel fleet back in Hope Dies. After the last issue reintroduced a number of characters, this issue saw the return of another character from earlier in the series: General Kanchar from The Ashes of Jedha. One detail I forgot to mention from the last issue that carries into this one is that Han is wearing his jacket from the Solo film, which I enjoyed seeing. The team and plan Leia has put together is certainly intriguing and I'm curious to see how it plays out for her, though this issue ends up being primarly set up like the previous one. Trios' characterization was interesting here, I was glad to see her talk about the toll it takes to befriend someone with the intent to betray them. We didn't get to focus much on her point of view after Hope Dies when she was revealed as a villain so I'm happy to see some of that here. I don't find Kanchar to be a particularly character so I was indifferent to see him again. I look forward to seeing what ends up happening with Trios and how her conflict with Leia ends. Sana is still abset without even a mention this time, which makes me mildly concerned that we won't see her for the rest of this arc. Things are likely to pick up soon and once the action starts it'll be harder for her to reenter. I think it would be a bit of a waste to have brought her back for the previous arc only to send her away for the actual finale, considering she's been with the series since the beginning, so I hope to see her come back in. For the art, Angel Unzueta is back on the series after Andrea Broccardo did the art for last issue. I've been liking Unzueta's art less the more he's been on this series. The awkward faces stand out to me more and more. It hasn't gotten quite as bad as it was when Salvador Larroca did the art for the series but I would hope to like the art more for the final arc of Gillen's run. As I mentioned before, the issue is primarily set up, but it's decent set up. No big surprises but a solid first act for what I'm hoping will end up being a great arc!